Contrary to popular opinion, modern endodontic treatment is very similar to a routine dental care. It is usually done in one single session and without pain. An analgesic (painkiller) is given at the end of treatment to ensure a transition between local anesthesia and the phase of "sensitivity", postoperative normal reaction of healing. During the day of the procedure, it is recommended to renew the intake of analgesic every 6 hours, so as to provide post-operative comfort. Then you may feel the treated tooth more sensitive for several days; especially when pressure is exerted on it (chewing). This reaction is quite normal and varies from a simple sensitivity to more or less intense pain. To relieve the pain, a specific prescription will be given. if a temporary filling was placed into your tooth, it is common that a thin layer of cement can be removed between your appointments. pain does not go away after 2 to 3 days. 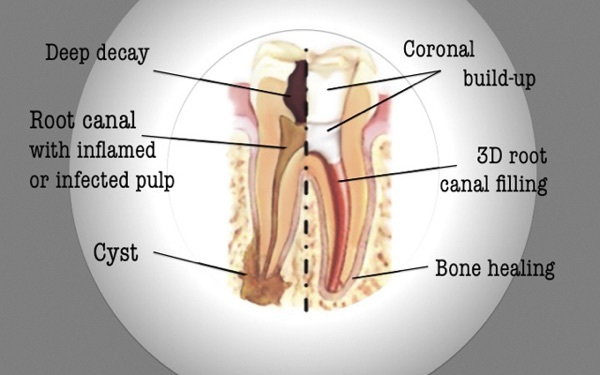 You must bear in mind that the root canal treatment is only one stage of the whole process leading to a fully functional tooth : the final restoration is essential to maintain a long-term success. This second phase is performed by your dentist during the next appointment. A report has been sent to him with all the elements necessary for a smooth continuation of your treatment.